Burgos was a beautiful and welcome city. The cathedral is grand and rightly takes up the center of attention, in a city with many noteworthy sights. I entered at the end of the day, sweaty, tired, and happy. Walking into the plaza, I found friends from the Camino who had arrived earlier. I asked them for advice on where to stay and for some general prices. They gave me information and, armed with a map from the tourist office, went to find a place to stay for two nights. The first place I stumbled upon was too “posh” for a disheveled pilgrim like me but I decided to ask for their price in order to get a base line for my search. Imagine my surprise when they gave me a price lower than my friends were paying at their hotels! I decided to stay at the posh place. Great decision. The room was more charming than any I had stayed in for a long while. I took a LONG hot bath, unpacked, and went out to find dinner, returning to where I had found my friends earlier. 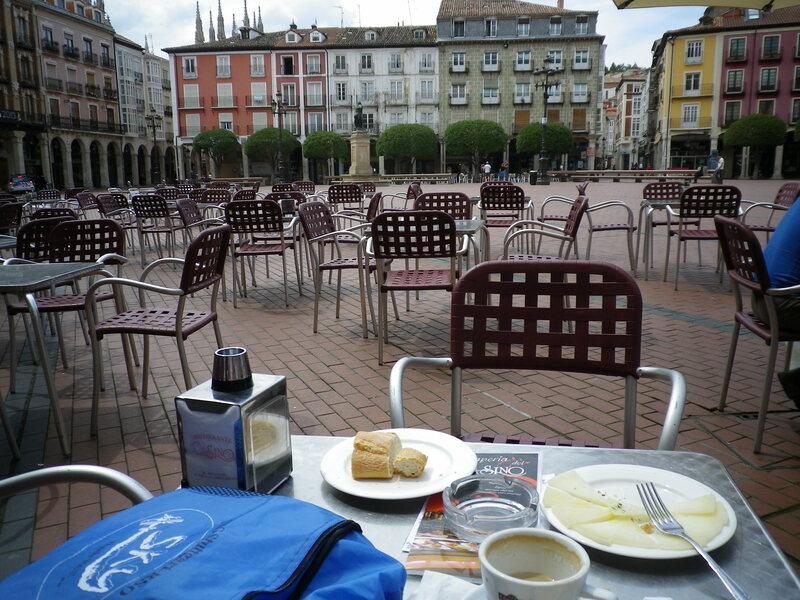 Because it was the plaza in the center of the city, in front of the cathedral, it was ground zero for pilgrims – not only did the Camino pass right through the plaza, but the municipal albergue, for pilgrims looking for overnight accommodations, was also within throwing distance. I didn’t find the same friends but did find others. Dom and Jean were having dinner with L., whom I had met a few days earlier when, after making herself a steak dinner in an albergue kitchen, took up my offer for my extra pasta. I had made dinner for myself that night in the albergue and, as usual when cooking for one, had quite a bit more than one person could eat. The “etiquette” is that extra food is offered for any pilgrims who have neither time and/or money to make a decent meal for themselves – the food is never wasted and the offer graciously accepted by anyone hungry. Like I said, L accepted my offer at the albergue, even though she had just made a steak dinner for herself. I had been a little put out – the offer had been intended for those hungry, not those who had just eaten a steak dinner – but an offer was an offer and maybe she was still hungry. One other hungry pilgrim took me up on my offer and wolfed down the food so I was glad I had made the offer. So now I found myself in Burgos, sitting down to eat with Dom, Jean, and L.
I didn’t know them very well and I asked where they were from and why they were walking. I guessed that Dom and Jean were from Ireland, an easy guess because of their accents. I guessed L was from Hawaii. Her Asian ancestry and all-American accent immediately took me to the islands. But, no, she was from British Columbia, BC as they say, in Canada. Did I detect a very subtle note of unhappiness that I had assumed she was Hawaiian because she was Asian? Had I made a terrible prejudicial faux-pas?? When I lived in Hawaii and people mistook me for Hawaiian, I was nothing but flattered. A lovely place, with nothing but good memories and vibrations for me, had I now offended her by suggesting she was from there? We all compared where we were staying in the city and, when I mentioned where I was and how much I paid, L announced that she would NEVER have paid that much for a room, that she could stay four nights on the Camino for what I had paid for one. Yes, I knew that was true. the albergue would have been one-fourth the price. 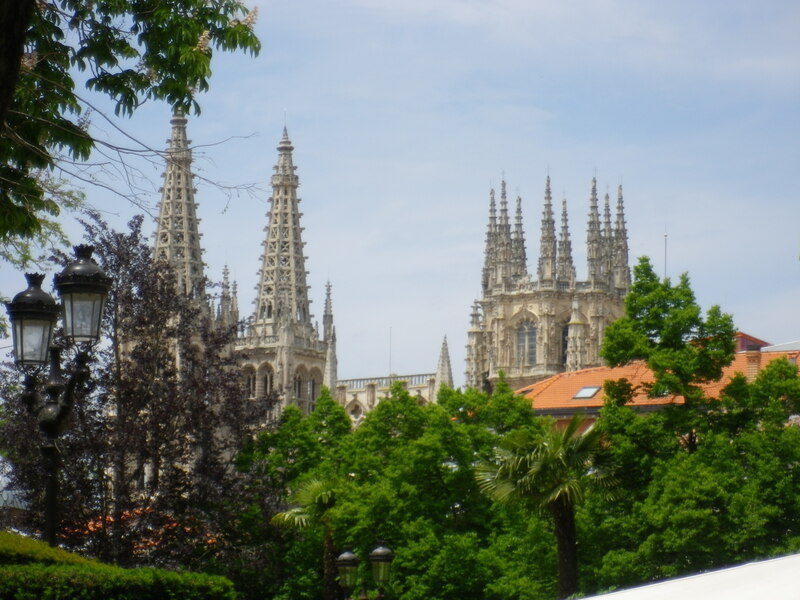 But I had planned on Burgos being one of my rest towns. I hadn’t wanted to sleep in a creaky bunk bed and to share a bedroom and bathroom with 20 people. I wanted my own bed, my own lovely, clean bathroom. I wanted to use someone else’s full size towel, not my hand-towel size microfiber one. I wanted to sleep on clean sheets, not in a sleeping bag. I hadn’t wanted to have to leave at 0800 the next morning. I wanted to sleep until maybe 0900 and have a leisurely breakfast the next morning, sans heavy backpack, muddy boots, and dirty hiking poles. And I knew I had done well with the price. So why did her comment so quickly and completely make me feel so badly about myself? I decided that I didn’t need to go through dinner with a person who made me feel uncomfortable – was this Big Tess talking in my ear (remember my saints? If not, go back a few blogs and read up on my traveling companions). I left and had an ice cream sundae for dinner near my hotel. Had I offended L by assuming she was from Hawaii instead of from Canada? This still gnaws at me. Why did her comments about my choice of hotel instantly make me feel like a person who is incapable of making good choices? Why did I let her make me feel like an idiot? This gnaws at me still, also. This entry was posted in camino de santiago de campostella, Travel and tagged Camino de Santiago de Campostella, Spain, Travel, women hiking solo. Bookmark the permalink. Hi Kathy, I want to know what hotel it was you stayed in at Burgos. It looks great. I’d like to stay there myself next time! Ah – that L. She obviously has issues. The Camino will sort her out. There are some people you meet while traveling, particularly hiking or backpacker traveling, who regard it as a badge of honor to stay at the cheapest grubbiest places. As though that gives them status. That’s their thing. That’s how they define themselves. We all seek status, but we have to be careful that we don’t do so by trying to pull others down so we can leap onto their shoulders. Were you right to leave the table when you did? You might have been making a pointed statement to L that you weren’t prepared to put up with her judgment of you. Perhaps later she felt awful. Sometimes people feel compelled to speak before they think. Then they regret it later. If you meet up with L again, can I suggest that you be as friendly as all get-out, and see what happens. You might find that your act of friendship is what she needs to reassess herself, and the way she views others. Thanks, Bill. Your advice is spot on, I think. I’m sure she didn’t mean to make me feel bad. Don’t worry, I didn’t jump up and leave the table – I was enjoying the company of Dom and Jean! I found a way to nicely excuse myself and move on. (they were already half-way through dinner anyway). I do hope to meet L again and I shall be as friendly as all get out 🙂 The Camino exposes us to all kinds of experiences. 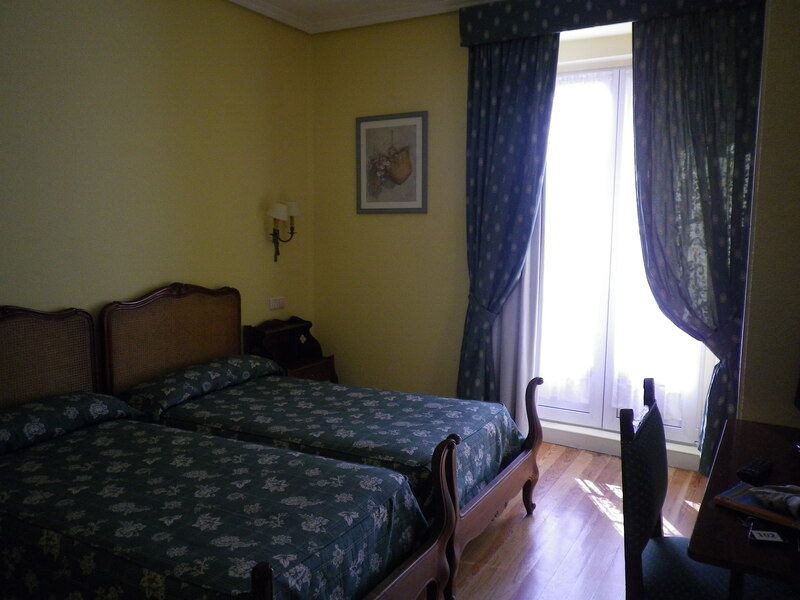 The hotel in Burgos was the Norte y Londres in Plaza Alonso. It was 40 euro a night and worth it. Cool – I’ll make a note of the hotel. Isn’t it wonderful sometimes just to splurge and have a nice hotel room where, as you say, you can have your own fluffy towel and a pillow! You take for granted these things, but when you’re a pilgrim staying in albergues, having these little luxuries every now and then means a lot.